You want the very best for your baby when you are away. 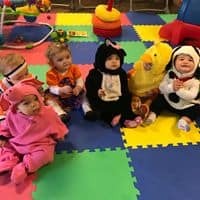 At Primary Colors, we provide a safe and peaceful environment building a positive emotional foundation as your baby begins to discover the world. Our loving, nurturing teachers keep you up to date on your baby’s activities and progress throughout the day. We make sure you are always involved every step of the way. 85% of a child’s brain is developed in the first three years of life. A secure, stress-free, and stimulating environment is key to learning. Neural connections that are not formed in the brain during these early years are lost forever. The first few years lay the foundation for success for the rest of your child’s life. We know you wish you could be there for each and every moment. That’s why we offer a collaborative infant program. Our staff works so closely with parents that they often feel Primary Colors is part of their extended family. Our approach to infant care and learning is as professional as it is personal. 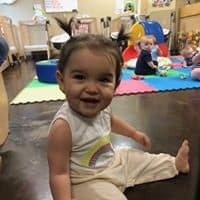 Through research-informed environments and activities, we help foster essential skills for school and life while nurturing your baby’s pivotal early development. The experiences during a young child’s first three years of life are pivotal to his or her physical, intellectual and social-emotional growth. Did you know that 82% of the brain develops during this time? 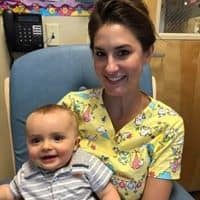 Your baby’s early foundational skills are fostered by our professional team through personalized care and engaging activities in a calm, secure environment. Cognitive: Early brain development is dependent on a multitude of factors including caregiver responsiveness, exposure to language and conversation, nutrition, and physical activity. Our infant curriculum takes a holistic approach to support your baby’s growth in all areas. Social-Emotional: Recent brain research reveals that emotional and cognitive development are closely interrelated. Providing responsive caregiving to infants not only helps them begin to regulate their emotions and gain a sense of safety and predictability in their social environments but also strongly supports attention and learning. Attentive Talking: Language is an important key to learning for infants—and not just hearing a steady stream of words. Research indicates a back-and-forth exchange of words, sounds, and expressions between caregiver and child is an active ingredient to brain development. Throughout the school day, our teachers talk to your baby and tune in to their responses and encourage vocalizing and babbling. Story Time: It’s never too early to start reading to children. Every day our teachers read to your baby increasing his or her awareness, listening and memory skills. Rhyming & Singing: Song and music strengthen cognitive skills and enhance babies’ moods. Our teachers often sign and coo to your baby, creating a loving and positive environment. Rocking & Cuddling: Teachers provide continual physical and emotional support to your baby through rocking and cuddling. These early interactions positively influence social-emotional development. 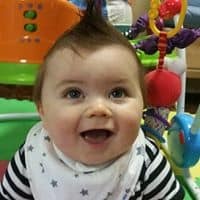 Baby Sign Language: Before your baby even learns to talk, babies can communicate when they are hungry, tired, hot or cold through baby sign language. They learn to sign more, all done and wet at about 8 or 9 months. Baby sign language is an effective tool to minimize an infant’s frustration with communication and boosts emotional development. Safety First: As babies develop their motor skills and minds, they need plenty of room to move and explore. To ensure your little one is safe, our nursery complies with state and federal safety regulations, as well as those imposed by toy and equipment manufacturers.